The Peace Accords Matrix (PAM) project tracks the implementation of 34 comprehensive peace agreements signed in civil wars since 1989. Less than one-third of these agreements contain review mechanisms providing an overall assessment of implementation. Most of these review mechanisms were retrospective and thus provided no immediate feedback or opportunity to improve implementation. To address this peacebuilding gap, the PAM project proposed an innovative methodology of contemporaneous holistic review of the Colombian Final Accord that was formally adopted by the negotiating parties and included in the agreement. The methodology codifies the 300-page peace agreement into 558 actionable items clustered under 74 subthemes and 18 Themes. Under the terms of the Colombia peace accord, the Kroc Institute is responsible for providing an assessment methodology and issuing reports on the status of implementation of the accord through its Colombia Barometer Initiative. Below is a summary of the highlights from our preliminary assessment of implementation. Based on our quantitative assessment of over 3,000 implementation events from Colombia, we calculated the degree of implementation for all 558 stipulations in the Colombian Final Agreement. As of the end of August 2017, implementation activity was initiated in 251 stipulations (45 per cent of the total). 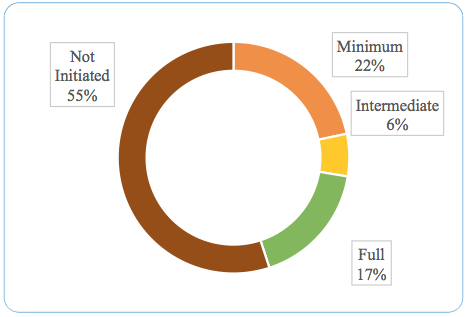 Of the 558 total stipulations, 121 are rated at minimum (22 per cent), 33 at intermediate (6 per cent), and 97 at full implementation (17 per cent) as shown in Figure 1. The number of stipulations in which implementation has been initiated has increased on a monthly basis from 89 (16 per cent) in December 2016 to 251 (45 per cent) as of the end of August 2017. 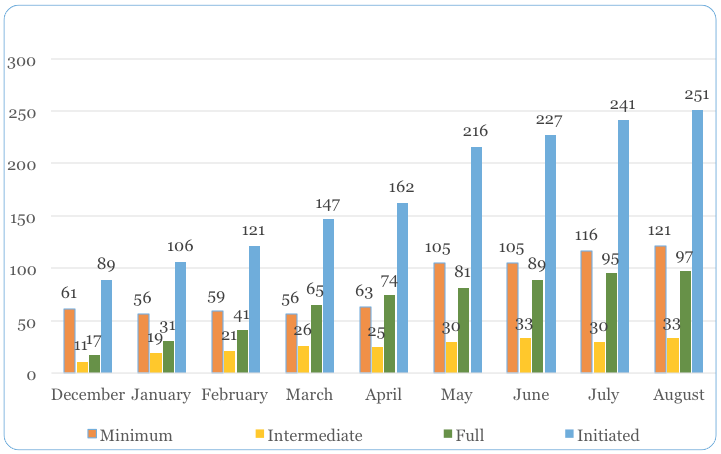 We see a steady progression in the number of stipulations reaching full and intermediate implementation throughout the period, as depicted in the figure below. From our comparative study of other comprehensive peace processes, we know that the priority objectives over the short term are to end direct hostilities, build confidence, create verification and dispute resolution mechanisms, and establish the institutional and legal prerequisites for implementation. Mid-term objectives involve primary electoral reforms that should be implemented before the first post-conflict election. Long-term implementation objectives mainly deal with truth and reconciliation and alleviating root causes of conflict. Colombia receives high marks on the short-term objectives. Significant progress has been achieved in short-term objectives such as establishing a bilateral ceasefire, laying down of arms, and setting up verification mechanisms (Themes 7, 18). Of the 35 stipulations in Theme 7 (Cessation of hostilities and laying down of arms), 89 per cent have been fully implemented, and nine per cent are intermediate, meaning they are on track to be fully implemented. This indicates that both the Colombian government and FARC have made a strong commitment to ending the conflict and moving toward peace. Comparative research shows that peace accords which contain fully implemented verification mechanisms go on to achieve a significantly higher rate of overall accord implementation than those lacking such mechanisms. The Colombia Final Agreement stands apart from all other peace accords in its extensive system of verification and monitoring (Theme 18). Of the 85 stipulations in this part of the accord, 35 stipulations (41 per cent) have been fully implemented; and 15 stipulations (18 per cent) are at the intermediate level and on track to be fully implemented. Thus the level of implementation in this part of the accord has been quite high. Greater progress is needed in medium-term objectives such as electoral and political reforms, security guarantees, and socio-political reintegration of former combatants. Currently, the majority of long-term objectives are yet to be initiated such as land access, rural reform, advancing social and economic development, holistic action against land mines, illicit crop substitution, production and sale of narcotics, public health, and assuring truth and justice for the victims of the conflict. Implementing these longer-term provisions will take time, but it is important to begin these long-term processes now to build momentum and address the root causes of armed conflict. The Colombia accord contains many stipulations that call for greater public participation in the implementation process, with many specific references to the role of women and ethnic communities. Implementation has been slow in many of these areas. The Final Accord contains 122 stipulations committing the parties to specific affirmative actions to ensure women’s leadership and participation in programs and entities in the peace process. No implementation progress is reported for 59 per cent of the gender related stipulations, with six per cent with full implementation. The “Ethnic chapter” of the accord contains 13 specific stipulations. Of these, eight percent are fully implemented, 15 per cent on track to be fully implemented. Initiation has yet to begin in 46 per cent of these stipulations. 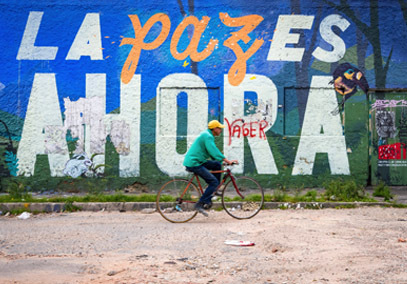 Our overall assessment is that the Colombia process is slightly ahead of implementation progress in other peace processes examined in the PAM database at the nine-month mark. Our analysis indicates high levels of implementation in Colombia in a number of prioritized areas related to ending hostilities, the cantonment process, the laying down of arms and the creation of institutional and legal mechanisms for implementation and verification. The progress realized in these priority items creates a foundation for achieving implementation of the medium to long-term objectives in the months and years ahead. Madhav Joshi is Research Associate Professor and Associate Director of the Peace Accords Matrix at the Kroc Institute for International Peace Studies. Jason Quinn is Research Assistant Professor, Peace Accords Matrix at the Kroc Institute for International Peace Studies.